In December 2009 the working day and seasonally adjusted current account of the euro area recorded a surplus of EUR 1.9 billion. In the financial account, combined direct and portfolio investment recorded net inflows of EUR 44 billion (non-seasonally adjusted). In 2009 as a whole, the working day-adjusted deficit on the euro area current account amounted to EUR 59.0 billion (about 0.7% of GDP), compared with a deficit of EUR 140.6 billion in 2008. Combined direct and portfolio investment recorded net inflows of EUR 251 billion in 2009, compared with net inflows of EUR 162 billion in 2008, mainly as a result of higher net direct investment in the euro area by non-resident investors. The working day and seasonally adjusted current account of the euro area recorded a surplus of EUR 1.9 billion in December 2009 (corresponding to a surplus of EUR 9.4 billion in non-adjusted terms). This reflected surpluses in services (EUR 4.5 billion) and goods (EUR 4.4 billion), which were only partly offset by deficits in current transfers (EUR 5.2 billion) and income (EUR 1.7 billion). According to the preliminary results for 2009 as a whole, the working day-adjusted current account recorded a deficit of EUR 59.0 billion (around 0.7% of euro area GDP), compared with a deficit of EUR 140.6 billion in 2008 (around 1.5% of euro area GDP). This development was due to a shift in goods from a deficit (EUR 9.5 billion) to a surplus (EUR 34.7 billion), and decreases in the deficits in income (from EUR 73.8 billion to EUR 32.9 billion) and in current transfers (from EUR 98.3 billion to EUR 91.3 billion), which were only partly counterbalanced by a decrease in the surplus in services (from EUR 41.0 billion to EUR 30.6 billion). In the non-seasonally adjusted financial account, combined direct and portfolio investment recorded net inflows in December 2009 (EUR 44 billion), as the net inflows recorded in portfolio investment (EUR 46 billion) significantly exceeded the net outflows in direct investment (EUR 2 billion). The net outflows in direct investment resulted from net outflows in other capital (mostly inter-company loans) (EUR 8 billion), which were partly offset by net inflows in equity capital and reinvested earnings (EUR 6 billion). The net inflows in portfolio investment were accounted for by net inflows in both equity (EUR 36 billion) and debt instruments (EUR 10 billion). 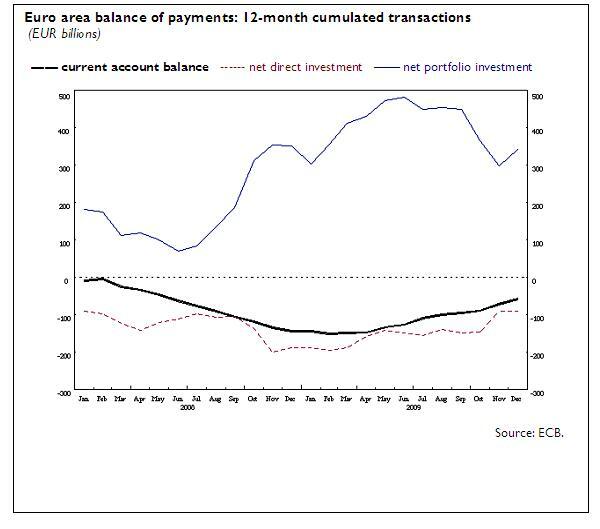 The developments in equity were predominantly accounted for by net purchases of euro area securities by non-residents. Financial derivatives recorded net inflows of EUR 3 billion. Other investment recorded net outflows of EUR 51 billion, reflecting net outflows for MFIs excluding the Eurosystem (EUR 68 billion), the general government (EUR 14 billion), and the Eurosystem (EUR 11 billion), which were partly offset by net inflows for other sectors (EUR 42 billion). Reserve assets increased by EUR 1 billion (excluding valuation effects). The Eurosystem’s stock of reserve assets stood at EUR 462 billion at the end of December 2009. In 2009 as a whole, combined direct and portfolio investment recorded cumulated net inflows of EUR 251 billion, compared with net inflows of EUR 162 billion in 2008. This increase was mainly the result of lower net outflows in direct investment (down from EUR 189 billion to EUR 91 billion), which were only partly offset by lower net inflows in portfolio investment (down from EUR 351 billion to EUR 342 billion). The developments in direct investment were characterised by an increase of foreign investment in euro area companies, as well as a net reduction of euro area investment in foreign affiliates. In addition to the balance of payments for December 2009, this press release incorporates revisions for November 2009. These revisions have not significantly altered the previously published results. A complete set of updated euro area balance of payments and international investment position statistics is available in the “Statistics” section of the ECB’s website under the headings “Data services”/“Latest monetary, financial markets and balance of payments statistics” . These data, as well as historical euro area balance of payments time series, can be downloaded from the ECB’s Statistical Data Warehouse (SDW) . Data up to D ecember 2009 will also be published in the March 2010 issues of the ECB’s Monthly Bulletin and Statistics Pocket Book. Detailed methodological notes are available on the ECB’s website. The next press release on the euro area monthly balance of payments will be published on 18 March 2010.